When Salt Lake City Local 354 member Jared Brydson returned from the IBEW's International Convention in 2016, he was looking for ideas to increase engagement among new members. Then he and Business Manager Russ Lamoreaux landed on the idea of a boot camp. "Local 354 is a relatively young local, and we recognized that our future is going to hinge on how active our members are going to be," said Brydson, who chairs Local 354's Reach Out and Engage Next Generation Electrical Workers chapter, an IBEW initiative to engage and foster the next generation of union members. "We're actively trying to create a culture shift in participation." Local 354, like a lot of locals, has members coming in through traditional apprenticeships as well as through the construction wireman/construction electrician alternative classifications. Brydson and Lamoreaux decided that one way to bring people together would be to offer a monthly class that lets everyone practice their skills while doubling as a no-pressure space to talk about the union. And there would be food. "I like that it's member-operated," said Zackary Webb, a CW who joined the local in February 2018 and is now an apprentice. "It makes it more easy going and it creates an atmosphere where everyone's there for each other. And there's free donuts." Brydson and others teach things like the basics of pipe bending and branch circuit wiring. And fifth-year apprentices studying for their state journeyman tests can come in and practice more complex sections like motor control circuits. "As a new member to the trade, I felt ill-prepared and out of my element," said Lodule "Lulu" Lubanga, an apprentice who started as a CW. "But like any diligent student, I saw the boot camp as a resource to bridge the gap of my understanding and piece together the full picture of what to expect on the job and the journeyman exam." The monthly boot camps are part of the RENEW committee's goal to actively engage and educate all new members, Brydson said. "In my opinion, the key to creating union activists is to get to them early and often," Brydson said. "By creating a space where new members can ask questions, we're giving them contacts within the union and we're fostering relationships with our new members. And by building camaraderie we're breaking down the barriers between CW/CEs and apprentices, and that makes our union stronger." Fostering this next generation starts with a new member orientation run by Brydson that occurs right before the new members' first union meeting where they take their oath of obligation. Then Brydson notifies members about the boot camps and social events and educational classes. Those notifications are done by stewards and through more modern avenues like text messaging and social media. "Now more than ever, we get in front of our new members and constantly let them know about the happenings of Local 354," Brydson said. Having buy-in from Lamoreaux has been a big part of the program's success, Brydson said. "It's helping to break down that intergenerational gap that tends to form between age groups," Lamoreaux said. "I think it's an excellent investment in the future of the union." Brydson, who is also Local 354's vice president and an organizer, says the boot camps are primarily for skill-building, but the sense of union solidarity is creating its own muscle memory. "I'm definitely happy I chose to work union. It's been a great experience," Webb said. "I like how organized and comprehensive the schooling is. Plus, I'm making more money than I ever have before." Brydson says he's been in touch with a few sister locals about the boot camps, including Boise, Idaho, Local 291 and Pocatello, Idaho, Local 449. "I read somewhere that, on average, only 10 percent of union members are active in their union. As trade unionists, our strength comes from our solidarity and our participation. When we grow active and educated members from within, we are securing the future of the local," Brydson said. 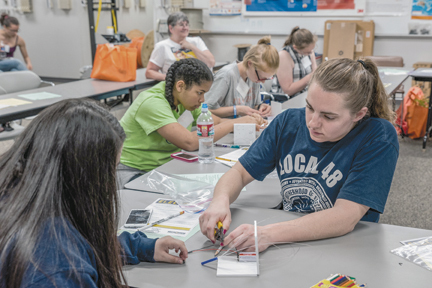 Salt Lake City Local 354's RENEW chapter is offering boot camps for new members to practice their skills while also learning about the benefits of the union. IBEW electricians from New York, Illinois and Minnesota swept the top honors at the third annual 2018 Ideal National Championship, held Dec. 1-3 near Orlando, Fla. The competition, sponsored by the tool and supply company Ideal Electric, judged union and nonunion journeymen and apprentices on skills such as installation, grounding and torqueing. Working individually and in teams of three, contestants competed for bragging rights as well as for cash prizes — all while using Ideal's tools, of course. The company also gave special awards for sportsmanship as well. "These competitions are a lot of fun for everyone who participates, but I'm always proud to see the outstanding skill on display from these talented IBEW men and women," said International President Lonnie R. Stephenson. "We know we're the best-trained electrical workers in the industry, but our brothers and sisters in this competition prove it year in and year out." Claiming victory in this year's professional team category were Lisle, Ill., Local 701 member Clay Noga and Elgin, Ill., Local 117's Will Barnett and Greg Anliker. The contest's rules require that all members of the professional squads work for the same contractor — in this case, Elgin-based Kellenberger Electric. "[The competition] gets better ten-fold every year," Noga said. "It's a fantastic experience overall." Five professional teams from the U.S. and one from Canada were tasked with trying to completely wire a framed studio apartment mockup in one hour. It's a fierce competition, Noga said. "You're giving 120 percent. It's just go, go, go." No team finished in the allotted time. "But we got the closest," Noga said, estimating that his crew could have gotten the job done if they had had another 45 seconds or so. Weighing speed, craftsmanship, and safety, the judges declared the Kellenberger team the winners, netting them a $60,000 prize to be split evenly among the three team members. Anliker also competed as an individual professional, a category in which he placed second in 2017. Through a bracket-style elimination process, the IBEW member defeated 63 other union and nonunion electricians to win himself an additional $75,000 prize. "I almost felt like I did better last year," said Anliker, laughing. Anliker said that he plans to put most of his combined winnings into savings, but he admitted that he is considering splurging a little on a paramotor — a fan-powered parachute aircraft — just for fun. His teammate Noga, a hunting enthusiast, said he would probably spend some of his share of the prize money on a new crossbow. Erik Martin, a member of Minneapolis Local 292, came in third among individual professionals in the 2018 competition — and won $10,000 — after placing eighth in that category the year before. "It's a blast," said Martin, who demonstrated such skills as bending pipes, installing switches and troubleshooting. "Each competition is a little more difficult. I'm looking forward to keeping it going." Martin, like many of his fellow competitors, brought family members with him to Florida to cheer him on. Ideal provided bleacher seating for the supporters and created a general game show atmosphere for the contest, complete with large video displays, strobe lights and fog machines. "It's really intense," said Watertown, N.Y., Local 910's Benjamin Budd, who placed first in the individual apprentice category and picked up a $30,000 prize. "Ideal does a good job of keeping up the suspense." Last year's first-place winner, Long Island, N.Y., Local 25's Michael Yass, followed Budd at a close second place to become $20,000 richer. "As a tradesman, it's nice to be recognized," said Yass. "Having my wife and kids on the sidelines really helped keep me going." Rounding out the IBEW sweep in the category and winning $10,000 was Wichita, Kan., Local 271's Corbin Rios. "Every round gets harder and harder," said Rios, the 2016 individual apprentice champion. The competition in Florida was the culmination of a series of local and regional events held throughout North America over the previous 10 months, pitting thousands of union and nonunion electrical workers against each other to whittle down each category's size. 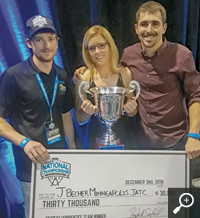 Coming in first among teams of apprentices was a crew from Minneapolis Local 292: Kate Flanery, her brother Patrick (a member of the 2016 winning apprentice team), and Jeremy Welle, who was on last year's winning team. 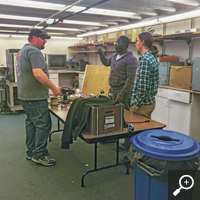 Derrick Atkins, the training director at the Minneapolis Joint Apprentice Training Center, said that determining which three apprentices work best together was crucial. "We get the apprentices together and they practice, and they rely on what they know and what they've done to get through," he said. Atkins said his team also prepared for the finals by watching video from previous years' competitions, to try to get a sense of what the judges might be looking for. "There is some luck to it, too," he admitted. The Minneapolis members specialize in residential work — and it happened that for Ideal's final competition, the apprentice teams were required to wire a mockup of a living room. Welle, who evenly shared the team's $30,000 top prize with the Flanerys, found the competition to be a lot of fun. "Most of the time, you don't get to interact with so many people from around the country," he said. Ideal started the annual event to help generate greater interest in the electrical trade, a field that the U.S. Department of Labor estimates will have nearly 70,000 openings in the coming years as greater numbers of older electrical workers retire. Dozens of cable and broadcast television stations in the U.S. scheduled a showing of the half-hour highlight show from the 2018 competition. To find out whether it's airing near you, visit idealnationals.com. The website also has information about the local and regional qualifying rounds for the 2019 competition, which got under way in March. 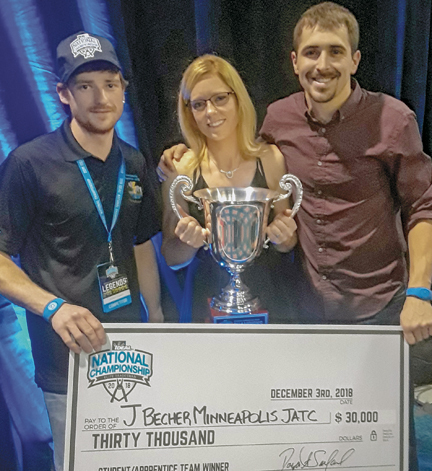 The first-place Student/Apprentice team at the 2018 Ideal National Championship: from left, Minneapolis Local 292's Patrick Flanery, Kate Flanery and Jeremy Welle. All parents want their children to get a good job that pays them a livable wage. For many, that means attending a four-year college institution. But for many others, there's an alternate path. If you're one of the older members of Generation Z, that is, the older side of the roughly 7- to 22-year-old age group, you've grown up during the Great Recession and may have seen older siblings pay tens of thousands of dollars to a college or university that is no longer the guarantee of a good-paying job it once was. Homeownership rates have plummeted while wages have stagnated and more and more wealth seems to only trickle up to the top 1 percent. All this is happening during a major construction boom. Coupled with the baby-boom generation reaching retirement, more and more construction jobs are opening up. The U.S. Department of Education reports that there will be 68 percent more job openings in infrastructure-related fields in the next five years than there are people training to fill them. A lot of those jobs offer a solid wage, and for those who go through a union apprenticeship, you can start earning on Day 1. "A union apprenticeship is often called 'the other four-year degree' for a reason," said International President Lonnie R. Stephenson. "It's a skilled trade that you need to learn, and it's one that pays you a good wage with benefits and the ability to retire. That's what all working people want." Unfortunately, career and technical education classes, also known as CTE or vocational education, have been sidelined in favor of the more illustrious-sounding college degree. "Starting about 30 years ago, it became a negative thing to work with your hands," Skip Perley, president and CEO of signatory contractor Thompson Electric Co., said to Electrical Contractor Magazine. "Blue-collar opportunities became the 'leftover' jobs when you couldn't make it in the white-collar world, and it became embarrassing for parents if their kids were trade or factory workers." Of course, they were never just "leftover" jobs, but the stigma caught on. "Too often, the implication has been that people in the trades weren't smart enough for college. But the truth is that people who think it doesn't take enormous skill sets to run a $10 million construction project are dead wrong," Perley said. "Schools have increasingly figured out that they've made a mistake, but we have 30 years of ingrained negative perceptions to get over." A 2017 report by the Brookings Institute stated that there's been a resurgence in CTE in the past decade, citing increased scholarship in the area as well as media mentions. It also noted that in 2015 alone, 39 states instituted 125 new laws, policies or regulations relating to CTE, many of which increased funding. As technology advances, and more people see the appeal of a job that is a skilled craft, something that comes with a sense of accomplishment not to mention the earning potential, the tide may be changing. "The truth is electrical contracting is highly technology-driven today. It's not just digging dirt and cutting wires, but about working with cutting-edge technology, which appeals to tech-savvy young people today," Kevin Tighe, the National Electrical Contractors Association's executive director, said in the Electrical Contractor. "Our field is embracing changes in technology, which is helping to grow the industry and create opportunities for young people, who will help further that trend. The guts of new buildings will still come down to electrical work, and the operations behind this will attract people who use joysticks and mouses." While much remains to be seen with Generation Z, there's already data suggesting this generation is more frugal and is prioritizing financial stability in a way that older generations may not have at a similar age. Fast Company reported in 2016 that 66 percent said their No. 1 concern was drowning in debt and more than half already have savings accounts. They also rate their top three priorities as getting a job, finishing college and safeguarding money for the future. And 75 percent believe there are ways to get a good education that don't involve going to college. "The thing is, these construction jobs aren't going away," Stephenson said. "So, if you're looking to jump-start your career and want to be able to put away some money at the same time, the trades are an appealing option. It's nice to see that the message we've been putting out there for years is resonating with young people. We hope to see more and more of them applying for IBEW apprenticeships in the years ahead." Many in Generation Z, those in their early 20s and younger, are looking to the security of a job in the skilled trades as opposed to a college degree. Missouri added 25,000 working people to its union membership last year, propelled by a major right-to-work win victory where Show-Me State workers made a compelling public case for the value of unions. Nationwide, union membership ticked down slightly, falling 0.2 percent according to a Bureau of Labor Statistics report. Unionized workers represented 10.5 percent of the total U.S. workforce. But Missouri bucked the trend. Last year, 9.4 percent of all the state's workers were union members, up from 8.7 percent in 2017, reported the St. Louis Post-Dispatch. The increase, while not enormous by any measure, was fueled in part by the high-profile campaign against Proposition A, where voters overwhelmingly rejected a 2017 right-to-work law passed by Republican majorities in the Legislature and signed by then-Gov. Eric Greitens. 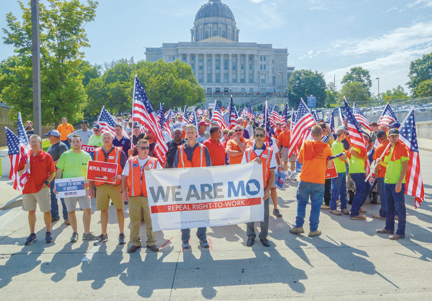 "With thousands of union members collecting signatures for Prop A and knocking on doors during the campaign, we put a real face on organized labor in Missouri," said St. Louis Local 1 Business Manager Frank Jacobs. "Voters found out it was their neighbors, their kids' coaches and their church members that were going to be affected by right-to-work. That awareness was certainly a factor in the rise of union membership in our state." Right-to-work laws allow employees to opt out of paying fees to the unions required to represent them, despite receiving the benefits of a collective bargaining agreement. In states with such laws, working people make about 3.1 percent less in wages than their counterparts in non-right-to-work states, according to the Economic Policy Institute. The BLS statement similarly noted that nonunion workers had median weekly earnings that were 82 percent of what union members brought home, or $860 versus $1,051 per week. Union membership rates of public-sector workers, at 33.9 percent, continued to be more than five times higher than that of private-sector workers, which is 6.4 percent. Men continued to have a higher union membership rate, 11.1 percent, than women at 9.9 percent. Black workers remained more likely to be union members than white, Asian or Hispanic workers. The AFL-CIO also noted that the BLS report doesn't paint the entire picture of labor organizing in 2018, reported the Huffington Post. "[Last year] was one of the most substantial years for collective action in American history," the federation said. "In the face of unprecedented attacks, the labor movement continues to show tremendous resilience. Public approval of unions is soaring. And new organizing campaigns in nonunion workplaces are gaining steam." In August of last year, Gallup released a poll showing that 62 percent of Americans approve of unions, roughly matching that of the prior year, and the highest since 2003. Missouri union members overwhelmingly defeated right-to-work at the ballot box in 2018. Now, it's paying off in renewed energy and new members.